A camera stand reduces the risk of motion blur. They are practical in poor lighting conditions and when shooting with long shutter speeds. 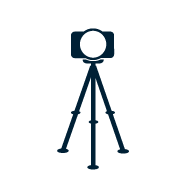 There are camera stands with one or more legs as well as stands adapted for digital cameras, camcorders and mobile phones. In the filter, select the load capacity, if the tripod head should be replaceable and the size of the tripod.